Rank attribute on edge has five values "same", "min", "source", "max", "sink". Except "same", I have no idea when to use other values. With test on my vim environment, I can realize there is some difference btw these values. But don't know exactly what they are for. Leaving the rank empty or using rank=same are used far more often. These other four are usually only used in special circumstances. When used alone, min and source have the same function: putting all those nodes on the minimum rank (the top row of a TB graph). The difference between them is that min will allow other subgraphs in the minimum rank. Source will not. 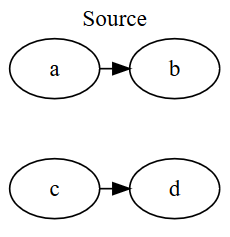 Source only allows other subgraphs of min or source to be on the minimum rank. You will end up with 2 rows. a -> b will be above c -> d.
If you change source to min, you will only get one row. a -> b will be to left of c -> d, all in the min rank. Max and sink are the equivalents for the bottom of the graph. Not the answer you're looking for? Browse other questions tagged graphviz dot or ask your own question. Line up the heads of Dot graph using PyDot? How to change Graphviz subgraph rank?